The Alberni Athletic Hall was filled on the evening of Friday, Sept. 29 to mark the arrival of Tour de Rock cyclists as they made their stop in Port Alberni. 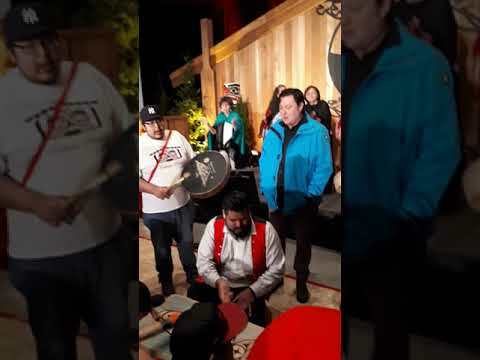 A small crew gathered in the traditional home of the Mowachaht Muchalaht First Nation in September to begin renovations on a church erected 61 years ago in honour of a Catholic pope. A rugby player with Nuu-chah-nulth roots has been named to a new professional rugby team set to take the field in Seattle next year. The NTC Quu’asa staff led an Orange Shirt Day walk on Friday, Sept.29 in recognition of the harm the residential school system did to the children’s sense of well-being and self-esteem. Nuu-chah-nulth nations will be hosting a fundraising event in support of the Canadian Cancer Society’s 20th annual Cops for Cancer Tour de Rock. Two Nuu-chah-nulth Nations have been recognized for Outstanding Business Achievement through the BC Aboriginal Business Awards. Students at the Eighth Avenue Learning Centre participated in the KAIROS Blanket Exercise on Wednesday, Sept. 27, which illustrates how Europeans affected First Nations lands over the last two centuries. A new president has been voted to lead the Nuu-chah-nulth Tribal Council, with Dr. Judith Sayers winning over incumbent Debra Foxcroft. On Thursday, Sept. 21 the Alberni District Secondary School marked the start of another school year by hosting its annual welcome feast for students and families. As the first person in her family to go to university, Justice Manson is driven to set an example. A dead bullfrog found stuck to the grill of a tourist’s car at the Rainforest Trail parking lot has a Clayoquot Sound ecologist concerned about the safety of the local amphibian habitat. The Sugarloaf Bridge in Zeballos is nearing completion and residents are excited to have their village connector back. The 2017 election for Nuu-chah-nulth Tribal Council President and Vice President will take place at the NTC AGM, Sept. 25, 2017 in Maht Mahs gym, Port Alberni. Tseshaht First Nation has signed a five-year collaborative agreement that will see the excavation of middens at some of their ancient village sites in the Broken Group Islands.